We've been doing some research / price comparisons on getting some attached floor to ceiling book cases on a wall in our living room that currently has floor to ceiling mirrors. I'm not a huge fan of the mirrors - they do make the room look bigger - but we really need the wall space for storage. We have more books and records then we know what to do with. My vision? 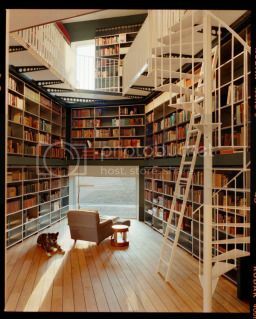 Like I said - floor to ceiling book cases - with a rolling ladder in front so my little 5' 2'' self can reach everything (See picture above.) But it seems private libraries are expensive to build. Someone remind me that my next house should already have one. Anyways we're going to figure it out. It probably will be more along the lines of custom bookshelves from Ikea. Or maybe the husband will take a crack at buying the wood and building it from scratch. But I have a feeling that the rolling ladder is out. 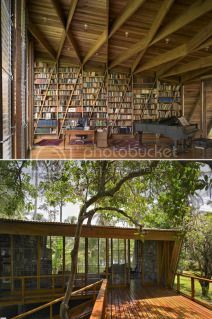 So - I've been fixated (to say the least) with pictures of peoples beautiful home libraries. Flavorwire has a whole list of beautiful ones. Yah, We're thinking that is the best bet too. I just need to go over to Ikea one weekend and check them out. I second ikea. They are the only place you can get super tall bookcases without spending a fortune. We have their Billy shelves with height extensions. Thanks Tara - I think Jonny looked at ones with height extensions - so I'll check out the Billy ones. Maybe they are the same. Glad to get such good feedback on ikea shelves!